Real. This week brings us the ninth volume of this gritty, moving series about young men in the world of wheelchair basketball. It was repeated recommendations from Manga Curmudgeon David Welsh that compelled me to try this series, and I’ve been grateful for it ever since. The volume focuses exclusively on Nomiya and Takahashi, each of whom is facing a particularly difficult task. Nomiya, a bumbling high-school dropout who has never really played serious ball, has determined to go pro, and Takahashi, a fierce high-school athlete now paralyzed from the chest down, is struggling to find meaning in a body he can barely pull off the floor. … Nomiya’s journey, especially… creates the volume’s shonen-like tone, with emotionally escalating scenes driven by a level of brazen determination and raw inspiration that could rival that of any WSJ title. You can almost hear the power rock if you listen hard enough, as Nomiya firmly declares his goals, undeterred by detractors or doubt. Fortunately, Takahashi’s story provides a nicely ambiguous contrast. The character’s constant need for external comparison–the way he compulsively ranks himself against other rehabilitation patients as though his entire self-worth relies on superiority to others–is pushed front and center, so much so that even he begins to see the impossibility of his system. The realization is subtle, but brutal, and his subsequent struggle to determine even a single, realistic goal for himself is genuinely painful to watch. His story is so compelling, I barely missed the wheelchair basketball, which is saying quite a lot … It’s an uncommonly moving manga, really. I can’t recommend it enough. What’s most impressive about this series … is Inoue’s ability to get inside his characters’ heads and transform their thoughts and feelings into compelling narrative … Yet, through all this, Inoue deftly steers clear of allowing his story become mired in its own weight. Even the series’ heaviest sequences are a true pleasure to read. Something that seems important to note, and possibly why Real is able to avoid becoming intolerably dark, is that it’s clear from the beginning that Inoue genuinely likes people. Despite the fact that each of his characters has endured terrible heartbreak, pain, and various levels of personal misery (not to mention that most of them have also been responsible for causing significant pain to others), Real is far from cynical. There is no overarching disappointment in humanity here, no deep bitterness, no long-winded speeches about the unavoidable fallibility of the species. Even his characters’ most bitter reflections are directed toward individuals rather than humanity as a whole. Inoue’s artwork in this series is impressively mature … the world of Real is unpolished and gritty. Inoue’s early expressiveness is even more pronounced in this series, and much more detailed. Also, despite some great dialogue, Inoue lets his artwork do the bulk of the storytelling. Important moments are played out visually, panel-to-panel, without the need for any narration or extraneous dialogue to pick up the slack. Both heart-wrenching and down-to-earth, this series makes the most of its human drama, both on and off the court, without ever sinking into melodrama. Simply put, Real is real. Highly recommended. If you haven’t ever picked up this fantastic seinen sports manga, now’s the time to start. What a great pick! I more or less started reading Real because my local library happened to have it on the shelf. I didn’t have much interest in “sports” manga, but this series is so much more than that! I agree with your recommendation—the series is fantastic. Yes, I agree! I’m not a big sports manga fan either, so it’s significant how much I like this series. I, too, am a huge fan of Real. I’ve had it twice as my #mangamonday on twitter. This work is a serious piece of art both in the writing and the drawing. To me Inoue, has made an intimate portrait of life changing ordeals. It never fails to inspire me and break my heart at the same time. 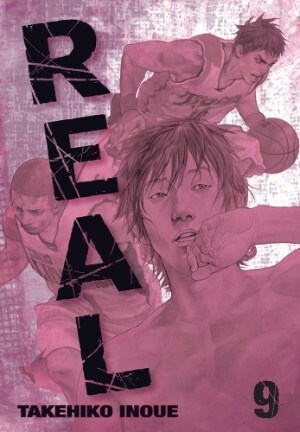 Real deserves to be a choice on the Manga Movable Feast! There is just too little popular media out there about people struggling with dissabilities, and some of what is depicted (Artie in Glee, anyone?) tends to be offensive. Real has a more balanced and nuanced portrayal of individuals dealing with disabilities than any other pop culture potrayals I’ve seen, possibly ever (except for “With the Light” which is a great story of a family raising an autistic child. That title needs more attention, too.). It’s also chock full of compelling characters and beautiful art. Takehiko Inoue and Real deserve a lot more attention and love! Thanks for your pick!